Posted by jtintle in European Space Agency, Huygens, JPL, NASA, Saturn, Space Fotos, Titan, University of Arizona. Original Caption Released with Image: Images from the European Space Agency’s Huygens probe descent imager/spectral radiometer side-looking imager and from the medium resolution imager, acquired after landing, were merged to produce this image. The horizon’s position implies a pitch of the imager/spectral radiometer, nose-upward, by 1 to 2 degrees with no measurable roll. “Stones” in the foreground are 4 to 6 inches (10 to 15 centimeters) in size, presumably made of water ice, and these lie on a darker, finer-grained substrate. 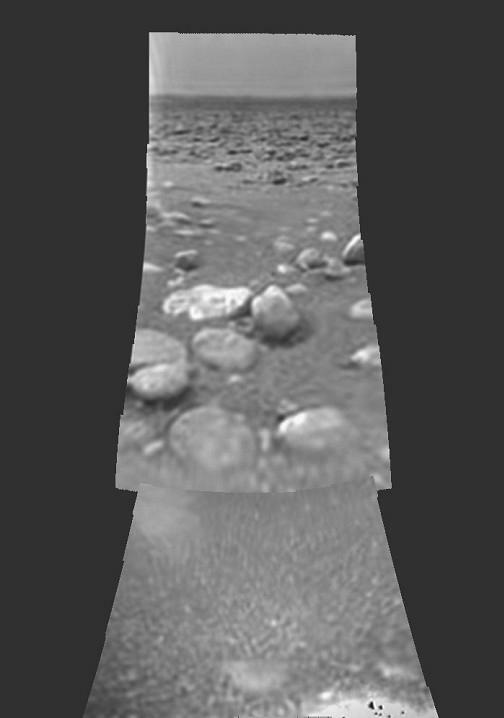 A region with a relatively low number of rocks lies between clusters of rocks in the foreground and the background and matches the general orientation of channel-like features in the panorama of PIA06439). The scene evokes the possibility of a dry lakebed. Posted by jtintle in JPL, Mars, MARSIS antenna, NASA, NewScientist, Space Fotos. Posted by jtintle in Earth, Langley Research Center, NASA, Space Fotos. 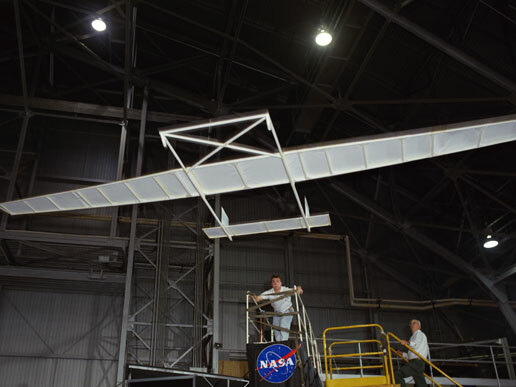 This 1992 photograph shows a world record breaking paper airplane inside a hangar at NASA’s Langley Research Center in Virginia. Posted by jtintle in Earth Observing System (EOS), Earth, Moderate Resolution Imaging Spectroradiometer, NASA, Space Fotos, Terra satellite. Explanation: The rich and vibrant greens in this image depict the aptly-named “Emerald Isle�?. Ireland (also called the ‘Republic of Ireland’) comprises about 5/6 of the island, while Northern Ireland, a region of the United Kingdom, encompasses the remaining portion. The darker colors in this image signify the coastal mountain ranges, while the lighter colors indicate the central lowlands or plains. In the past, forests covered the entire island, but the island was virtually stripped of its trees in the 17th century. Since then, agriculture has dominated the landscape, although currently Ireland’s economy is dominated by the industrial and service sectors. Ireland is located at high latitude (between 51.5 and 55.5 degrees North), but its climate is very mild: the average temperature in Winter is about 4 degrees Celsius (39 degrees Fahrenheit), while the average Summer temperature is about 16 degrees Celsius (61 degrees Fahrenheit). This condition is caused by the North Atlantic Current or Drift (of which the Gulf Stream is a part); warm water from the Gulf of Mexico is carried to the North Atlantic by strong ocean currents. Some of the water evaporates, making the water that remains much saltier and colder, and, therefore, more dense. It then sinks towards the ocean floor and is carried back in the direction from which it came. Recent research by NASA and other scientists indicates that this conveyor belt-like system may have been, and continue to be, disrupted by global warming. Posted by jtintle in JPL, Mars, Mars Global Surveyor, NASA, Space Fotos. This Mars Global Surveyor (MGS) Mars Orbiter Camera (MOC) image shows complexly-eroded terrain within a partially-filled impact crater in Noachis Terra. Posted by jtintle in ASU, JPL, Mars Odyssey, NASA, Space Fotos, Thermal Emission Imaging System (THEMIS). This linear features near the South Polar Cap appeared during the height of southern summer. 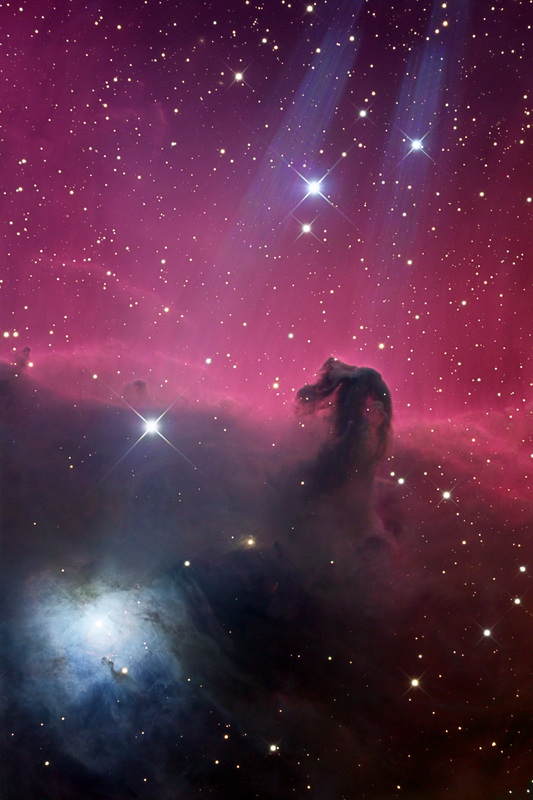 Posted by jtintle in Antilhue Observatory, APoD, Deep Space, Horsehead nebula, NASA, NGC 2023, Space Fotos. Explanation: Sculpted by stellar winds and radiation, a magnificent interstellar dust cloud by chance has assumed this recognizable shape. Fittingly named the Horsehead Nebula, it is some 1,500 light-years distant, embedded in the vast Orion cloud complex. About five light-years “tall”, the dark cloud is cataloged as Barnard 33 and is visible only because its obscuring dust is silhouetted against the glowing red emission nebula IC 434. Contrasting blue reflection nebula NGC 2023 is visible on the lower left. In this gorgeous color image, both Horsehead and NGC 2023 seem to be caught in beams of light shining from above — but the beams are actually just internal reflections from bright star Sigma Orionis, just off the upper edge of the view. Posted by jtintle in JPL, NASA, Space Fotos, TPOD. 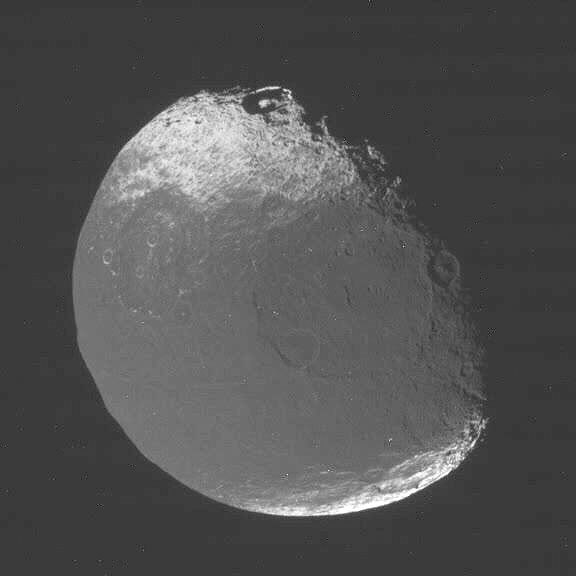 Credit: NASA/JPL/Space Science InstituteMost solid bodies in the solar system are pock marked with circular features that are heedlessly assumed to be “impact craters.�? A more careful examination indicates that many of them are likely the result of electrical discharge activity. In the Electric Universe most craters on celestial bodies are scars left by electrical discharges. Two or more filaments in a Birkeland current remove material from a surface as they rotate around the current’s axis. This action leaves a circular depression with steep walls. As the current varies, the depth of excavation will vary, ften producing terraces along the walls. 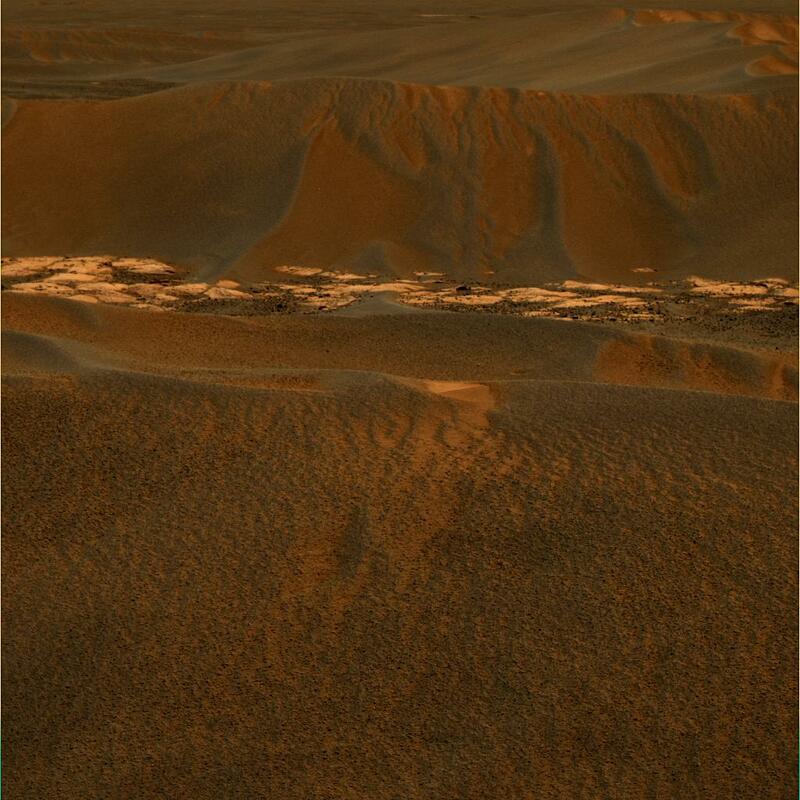 Posted by jtintle in JPL, Mars, Mars Rovers, NASA, Space Fotos. 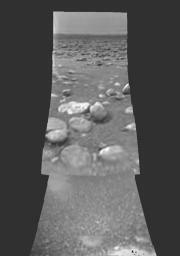 These images were acquired by NASA’s Mars Exploration Rover Opportunity using its panoramic camera on sol 644 (Nov. 15, 2005; upper two images) and its navigation camera on sol 645 (Nov. 16, 2005; lower image). The view looks towards the east, covering a large wind-blown ripple called “Scylla” other nearby ripples and patches of brighter rock strewn with dark cobbles. Panoramic camera bands L4 (601-nanometer wavelength), L5 (535 nanometers), and L6 (482 nanometers) correspond to red, green, and blue bands in the false-color image shown in the upper left. The blue-tinted colors associated with the scours and ripple crests are probably due to the presence of basaltic sands mixed with hematite-rich spherules. Color patterns on the larger ripple flanks are caused by different amounts of reddish dust. The larger ripple flanks have an intricate mixture of erosional scours and secondary ripples extending downward from the main ripple crests, suggesting that these ripples have most recently encountered a period of wind erosion and transport of their outer layers. 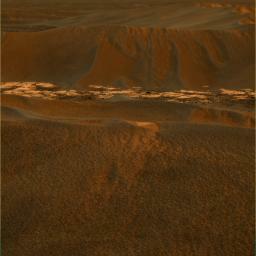 For comparison, the same panoramic camera image is shown here, but in this case rendered as an approximately true-color composite. The Caspian Sea dominates this image at the crossroads of Europe and Asia. The Caspian is just Southwest of the Ural Mountains, the traditional dividing line between the two continents. It is bordered by Russia and Azerbaijan to the West, Kazakhstan to the North, Turkmenistan to the East, and Iran to the South. The Caspian is the largest inland body of water in the world, measuring over 370,000 square kilometers (143,000 square miles). It is fed by the Volga and Ural Rivers, but it has no natural outlet; instead, water is lost primarily through evaporation. It is relatively shallow, measuring only about a 1 kilometer (0.6 miles) deep; in contrast, the deepest lake in the world (Lake Baikal) is 1.6 kilometers (0.9 miles) deep but only about 31,000 square kilometers (12,000 square miles) in area. The Caspian, although sometimes classified as a lake, is comprised of salt, not fresh, water. The Caspian Sea is a major source of sturgeon, a highly valuable type of fish that produces most of the world’s caviar.